Did you know that in the last 200 years western Sydney has lost 20% of its native animal species? In the same period it has lost only two of its native plant species representing only 0.1% of its diversity. Fauna ecosystem services are vital to bushland health but our native wildlife is struggling. 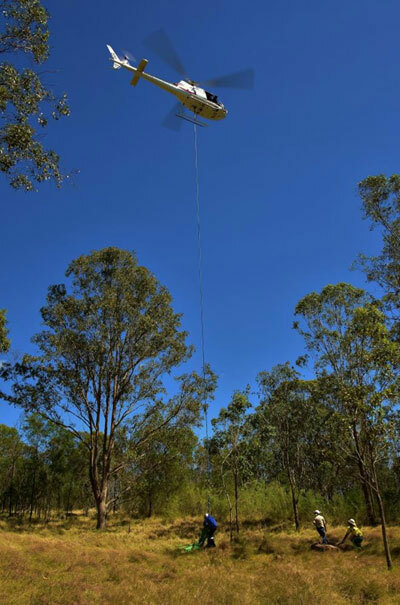 At a recent one day course presented by Peter Ridgeway of CLC we discovered how bush regenerators can actively help their native animals recover. Bushcare alone is not enough to save our wildlife but done wisely it can be part of the solution. The first step that a bush regenerator can take is to understand the characteristics of the habitat their site naturally falls in to. Sydney can be broadly summarized into six habitats – Grassy woodlands, Sandstone Forests, Heathlands, Rainforests, Freshwater wetlands, and Mangrove/Salt Marsh. The diversity of a habitat is a result of the underlying geology, climate and past uses of the site. Each habitat represents its own ecology and range of wildlife. To get a sense of the wildlife in your site the Atlas of Living Australia is an amazing resource. You can enter your address and find out all of the recorded sightings of animals in your area. Gastropoda” means “stomach foot,” and gastropods such as snails and slugs crawl along the ground rasping up food with a rough mouthpart called a radula, generally feeding on rotting wood and fallen leaves. Gastropods turn trash into treasure by cleaning up and processing detritus in their habitats and then in turn growing into a rich food source for a variety of larger animals such as lizards, snakes and birds. Insects pollinate flowering plants, worms compost organic matter and aerate soil and spiders keep insects under control and all of these animals are an also an important food source for lizards, snakes and birds. Birds are critical links within the vast food chains and webs that exist in the ecosystem. They spread seeds, consume enormous amounts of insects and pollinate many plant species. Reptiles such as snakes and lizards fill a critical role both as predator and prey species. Herbivorous species can also be important seed dispersers and even as pollinators. Amphibians such as frogs play an important role as an indicator species. Since most amphibians live in both aquatic and terrestrial habitats at some point in their lifecycles, they serve as indicators for the health of both environments. Due to the porous nature of their skin they are highly sensitive to any changes in their surroundings. They also are huge consumers of insects and in turn are a part of the diet of many birds, lizards and mammals. The majority of bats eat night-flying insects and play a significant role in controlling insect populations. About a third of bats are fruit or nectar feeding, and in the process they pollinate numerous plants and disperse seeds. Digging mammals such as bandicoots and native rats, echidnas, bilbies, bandicoots and wombats improve soil health by turning and mixing organic matter as well as breaking of very hard soils which would otherwise be impenetrable to plant seedlings. They improve water infiltration which increases soil moisture. Digging mammals spread important mycorrhizal fungi across the landscape. These fungi help plants to increase their absorption of nutrients and deal with our nutrient-poor Australian soils. Many of these important symbiotic fungi produce fruiting bodies below ground, and probably rely on digging and fungus eating animals to distribute their spores across the landscape. Peter’s research shows that small mammals have largely been lost from the Cumberland Plain Grassy Woodlands. Kangaroos and Wallabies lessen the possibility of bushfires by eating dry grass that ignite easily. Their soft padded feet and long tail are integral to the ecological health of the land, as regenerators of native grasses. Any seedling that falls into the long-tapering footprint of the kangaroo is buried into the hole left by the toenail. Covered and with moisture concentrated at one point, the germinated seedling has a chance of survival. Their tail drags along behind them while they are grazing, pressing the ground, rolling seeds into the earth. Their urine and faeces is a natural fertilizer (not excessively high in nitrogen which pollutes ground and surface water like livestock waste). Unlike livestock they do not produce greenhouse gases (methane, nitrous oxide), drink massive quantities of water, cause soil erosion, loss of soil nutrients and soil ecosystems leading to deserts. Once you understand your habitat you can develop an understanding of the type of wildlife that should naturally exist in your area. Although it may be exciting to have a bowerbird in your site, they are a rainforest or moist forest species and if your site is a Grassy Woodland then your ecosystem is out of balance. Trigger speed – 0.2 seconds is best. Size of image is not as important so use lower resolutions. You want to be able to store more photos and not use up all of the camera storeage on just a few images. You may have to spend in the $600 range to get a camera that will give you good results. Think about how to deploy the camera so that you get good shots, avoid a spot with long grasses moving in the wind or facing directly into the sun. You can also delay the next shot to avoid getting too many shots of a single animal. Leave for a 3 week period – will require about 4 batteries. Roundup presents an unusual situation because the active ingredient (glyphosate) is relatively harmless to animals but the surfactants can be highly toxic, especially to aquatic organisms. These surfactants are similar to those used in common household products and cleaners, and they’re controversial because the manufacturers do not have to disclose them for proprietary reasons. The surfactant POEA (polyethoxylated tallowamine, a chemical derived from animal fat) seems to be the most scrutinized “inert” ingredient in Roundup. It’s essentially soap (your shampoo contains surfactants), and because soap dissolves fat and cell membranes are made of fat, aquatic animals such as fish and frogs are sensitive to it. There are glyphosate based products that don’t contain POEA and are designed specifically to be used in aquatic ecosystems. Coarse woody debris such as sticks and logs are critical for terrestrial mammals and reptiles. In sandstone forests if you were able to collect all of the fallen litter from 100 square metres and fill a skip bin then you are on the right track. This represents about 20-30 tonnes per hectare, a natural density for this habitat. We visited a private conservation reserve which was originally grazed by cattle. It is being restored and a number of native animals have been reintroduced. An important part of restoring the property was to truck in hardwood logs recently lopped and rescued from the chipper. Know your local wildlife and monitor over time. Start from the ground up – wood debris, logs. Only remove as fast as you replace, weeds are key habitat. Avoid piles or keep them small, they are a magnet for native snails and frogs which can be a problem if they are burnt. Habitat spread throughout a site does more for wildlife than if it is piled together in one spot. Avoid disturbing dreys (Possum nests) and nests as they may be active although temporarily empty. Many wildlife rotate through multiple nests to ensure they are not detected by predators and for hygiene purposes. Avoid spray and mange it for wildlife. Don’t spray moist areas or moist vegetation (i.e trad) Remember all surfactants kill. 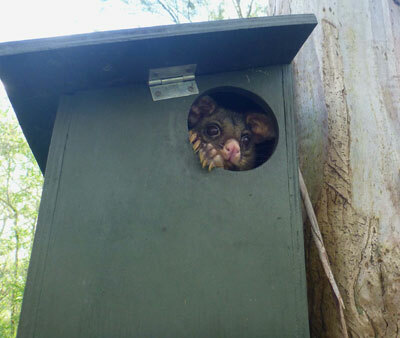 A nesting box is a rather poor substitute for tree hollows. Trees have wonderful insulation, keeping the animal warm and dry. They do not leak or fall apart within a short period of time. 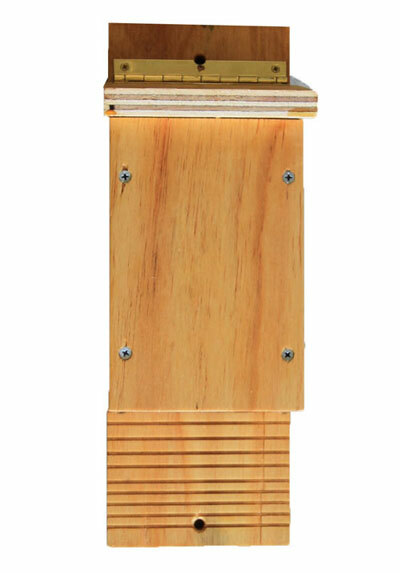 However a nesting box can be part of a strategy to help a declining species. Monitoring is important as you may not achieve what you set out to. It seems that the current common design for microbat houses attract one type of microbat, the Goulds Wattled Bat, much more than other species; this may be detrimental to the diversity of the local microbat fauna – we need time to learn more about this. If you want to build your own here is a great resource. Build your own Wildlife Nest Box. Save woody debris from the council chipper or collect habitat logs from local arborists. Install well constructed nest boxes for small, declining species. A big thank you to Peter Ridgeway of CLC and Peter Mobbs of Richmond College TAFE for giving us an insight into the big picture of caring for our land. http://australianmuseum.net.au/connect-with-us – free service by the Australian Museum to identify flora and fauna from photos. http://biocache.ala.org.au/explore/your-area – Atlas of Living Australia – find wildlife recorded in your area.